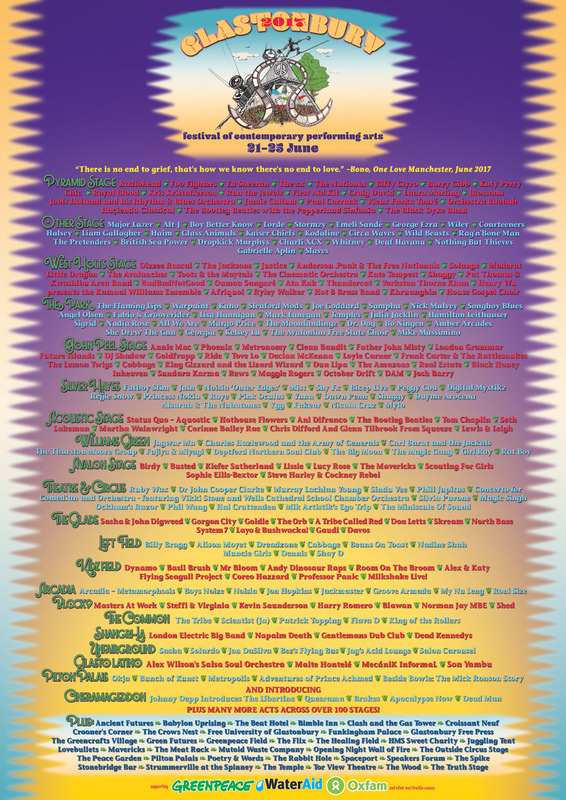 More artists have been added to the line-up for this year’s Glastonbury festival. It’s only a matter of days before gates open at Worthy Farm on Wednesday 21 June, and a whole host of extra artists have been added to the already excellent bill. Liam Gallagher has been confirmed to perform solo on The Other Stage on Saturday 24 June at 5.45pm. Liam previously played the festival in 2013 with his post-Oasis band Beady Eye. Meanwhile, actor Johnny Depp will be “guest of honour” at the festival’s new drive-in movie area, Cineramageddon. The Hollywood star will will introduce a personal choice of films on Thursday 22nd June, discussing his selections with Cineramageddon curator Julien Temple. The films include Jim Jarmusch’s Dead Man and the classic Withnail & I. Another artist added is NASA astronaut Mike Massimino, who will be speaking at the The Free University of Glastonbury on the Friday. Glastonbury Festival 2017’s headliners are Radiohead, Foo Fighters and Ed Sheeran.